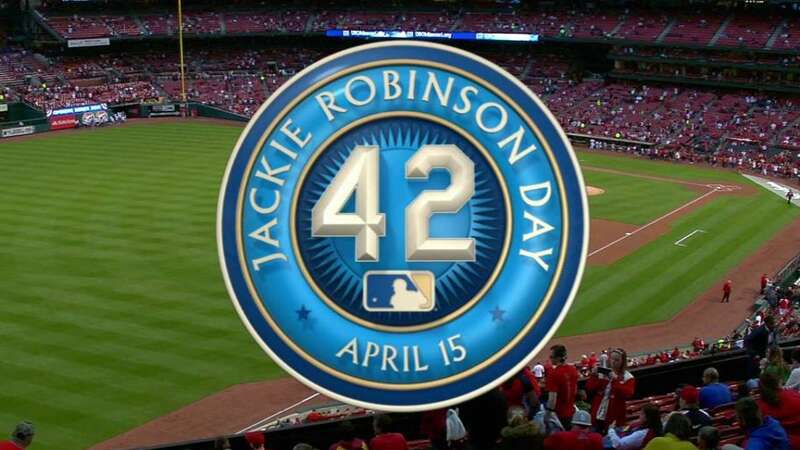 By request of Commissioner Bud Selig, as Major League Baseball celebrates the 62nd anniversary of Jackie Robinson breaking its color barrier on Wednesday, all big league players and uniformed personnel have been asked to wear the late Hall of Famer’s famous No. 42 on the field when the 30 teams celebrate the occasion. The past two years, as the momentum to wear Robinson’s number steamrolled through Major League clubhouses, Selig asked, but the act of wearing it was voluntary. Not so this year. This year’s main celebration of Robinson putting on a Brooklyn Dodgers uniform in a regular-season game for the first time, thus integrating MLB forever, is being hosted at Citi Field, the new home of the Mets. But there will be ceremonies in all the other 14 ballparks across the nation, with 62 Jackie Robinson Foundation scholars being honored. The Jackie Robinson Foundation, founded by his widow, Rachel, offers a $10,000 scholarship toward college tuition for highly motivated minority students. And this year, for the first time, a scholar will represent each of the 30 clubs. Last year, MLB made a $1.2 million commitment to the Jackie Robinson Foundation over a four-year period to fund scholarships in the name of each of the 30 clubs. The initial investment was $300,000, representing 30 of the $10,000 scholarships. And this year, each club will have its scholar at the ballpark on Wednesday. Last year, 330 uniformed baseball personnel took the field wearing No. 42. Nine full squads agreed to wear Robinson’s number: the Mets, Nationals, Dodgers, Cardinals, Athletics, Angels, Pirates, Rangers and Rays all wore the number Selig retired in perpetuity in 1997 on the occasion of the 50th anniversary of Robinson’s debut. Shea Stadium, in its final season, hosted the main event last year as the Mets shut out the Nationals, 6-0. This year, the festivities will begin at 12:30 p.m. ET with the official dedication of Citi Field’s Jackie Robinson Rotunda, which replicates the famous entry to Ebbets Field. That’s the tiny, long-gone ballpark one borough over from Queens where Robinson went out to play first base that day in 1947. The Dodgers defeated the Boston Braves, and the grand old game was never the same. Robinson retired in 1956, the Dodgers left for Los Angeles at the end of the 1957 season and the wrecking ball took Ebbets Field not long after. But the memories endure, and Robinson’s contributions now are celebrated on an annual basis. DuPuy will represent Selig at the rotunda dedication and the evening ceremony at Citi Field before the Mets play the Padres. He’ll be joined by Rachel Robinson; New York Gov. David Patterson; U.S. Sen. Charles Schumer, a Democrat from New York; and Fred Wilpon, the owner of the Mets, who grew up in Brooklyn as a devoted Dodgers fan and has long admired Robinson. Yankees closer extraordinaire Mariano Rivera is the last of the players who don the No. 42 on a day-to-day basis. Rivera and others who wore that number were grandfathered in upon Selig retiring it 12 years ago. When Rivera retires, there will be no more. Robinson was simply issued No. 42 as a matter of course by equipment manager John Griffin upon his arrival in Brooklyn a day before the 1947 season. 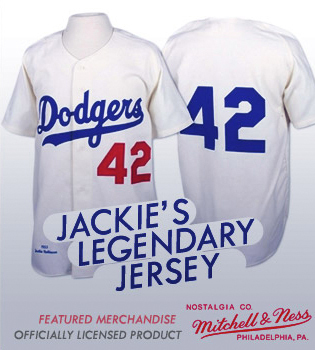 Robinson wasn’t the first or the last player to wear the famous jersey for the Dodgers. In 1939, George Jeffcoat did so when he pitched in only one game. And long after Robinson retired, it was issued again to Ray Lamb, a pitcher from the University of Southern California. But Lamb was so uncomfortable wearing the number in 1969 that he gave it up when the season ended. After that, it was never worn again by a Dodgers player, and it was retired by the club in 1972, a decade after Robinson was elected to the Hall of Fame. The idea of “un-retiring” Robinson’s number for a day belongs to Ken Griffey Jr., who is back with the Mariners this season. Two years ago, Griffey personally petitioned the Commissioner for the opportunity to wear it. He didn’t know what he was starting. Selig enjoyed the feel of it so much he now wants to blanket big league fields with all those No. 42s dancing across America.